The £89m Weymouth Relief Road, which has opened after more than 60 years of planning, has received a mixed response from residents. The 4.5 mile (7km) long road, which was first proposed in 1948, was granted planning permission in April 2008. It is now hoped the road will ease traffic during the Olympic 2012 sailing events, which will be held in the coastal towns of Weymouth and Portland. Some residents have welcomed the road, which will carry about 35,000 vehicles every day, and is aimed at improving journey times between Weymouth and Dorchester. Janet Blakey, from Broadway Village Stores on Dorchester Road, said it will ease congestion along the A354. She said: "The road is horrendous. Even if there is a small incident the traffic comes to a complete and utter standstill." Mrs Blakey is also confident that although traffic will now bypass her shop, business will improve. "We hope we will be able to offer customers parking here in the future. This would be a new lifeline for our little store." Ashley Newman commutes from Weymouth to Dorchester every day and believes his route to work will be quicker but said the main "compromise" was that part of the new road will go past his house. He said: "I think it could save me five to 10 minutes in travel time, each way. "My biggest concern is what happens when the traffic gets into Weymouth town centre now that the road system there has changed and roundabouts have been removed." These works are part of the Weymouth Transport Package, an £18m scheme to help the area cope with extra visitors during the Olympic and Paralympic Games when up to 50,000 visitors are expected. The project has seen objections from residents, and protesters occupied trees when work to clear the area began in 2008. Dr Guy Dickinson, founder of Bypass the Bypass, said: "[It is] completely wrecking an Area of Outstanding Natural Beauty (AONB), and part of ancient woodland." The Woodland Trust-owned Two Mile Coppice, part of the area where the relief road is built, is the only ancient woodland remaining in the Weymouth and Portland area. Dr Dickinson added: "I think it's a huge amount of money to spend on a road which is going to save an estimated three minute 25 seconds journey time from Dorchester to Weymouth." Matthew Piles, the strategic projects manager for the road, said it was difficult to give an accurate figure for the amount of minutes that will be saved on each journey. Councillor Christine James, a driving instructor and briefholder for transport and infrastructure at Weymouth and Portland Borough Council, said: "I know there are those that don't think the relief road will work, but I actually happen to think it will. "It'll encourage businesses and visitors alike to get around better. "Those who live or work locally should walk or cycle to ease tail backs." "It's going to be hugely beneficial to the people here, to business and to those using transport and accessing the countryside," he added. 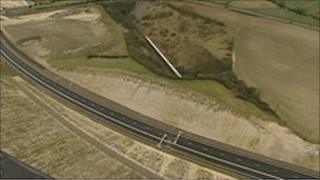 The Weymouth Relief Road was given the green light in December 2003 by the then Labour government. However work did not start until five years later after environmental groups lost a High Court legal challenge to stop it from being built. The road was due to open in December but the southern part took longer to complete than planned due to bad weather.